What type of Original Content will you produce? In this week’s episode, I discuss the importance of Original Content. There are 3 main types you can create: 1) Blog posts 2) Podcasts and 3) Videos. You need to decide which type is the easiest for you to produce and start creating. There are some impressive statistics in this episode about podcasts and videos. You maybe be surprised (or not) about where the digital age of information is heading! Should you choose audio, I wanted to share the link to Libsyn, which is one of the most common hosting sites for podcasts. They have many different levels of service, so they can grow with you as your needs change. For SEO – you want to give the search engine crawlers fresh new material to help your page be found in searches. For Social Media – when you have new original content on your website, you should be sharing it on social media to reach new audiences. To Build Authority – when you produce a lot of quality content in your industry, you will eventually start getting noticed. I also mentioned last week’s podcast #9 | Editorial Calendars. This was in reference to using social media to drive traffic back to your website. If you haven’t listened to that episode yet, do so to learn more about this tactic. If you haven’t read it yet, you should also read an article I wrote a few years ago that is still relevant today: Connecting Social Media to Your Website. 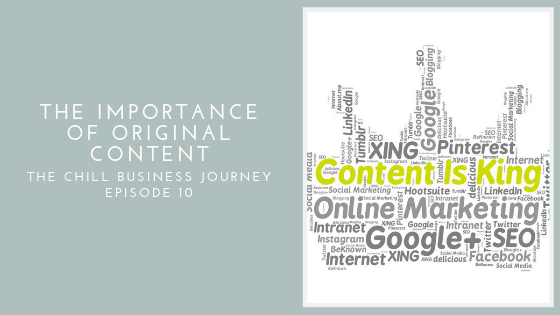 In this day and age of digital content, you don’t want your business to be left behind. Flexing the muscle of creating original content will eventually make the process not seem so difficult. And you don’t have to be perfect right out the gate! I promise you will get better over time.